Thin hair can be a problem at any age, but especially as we age. If you are missing that full head of hair you used to have, now might be the time to start using a professional product designed specifically to reinvigorate hair follicles and improve growth and thickness of hair. Bosley Professional's Revive line of products is a proven answer to getting thicker, fuller and healthier looking hair. Use the shampoo and conditioner followed by the thickening treatment daily for 30 days and see what we mean. 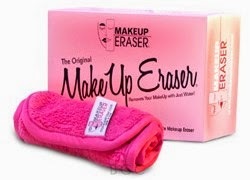 The Make-up Eraser Cloth is truly magic! This single pink cloth holds a cleansing process that promotes the health of your skin and still removes even waterproof make-up, including waterproof mascara. You simply wet the cloth and wipe your face. Make-up is gone and skin is clean! Best of all, this plush pink cloth is machine washable! It will last for 1000 washes and it's only $20. Copper was one of the first metals used in cosmetics. In ancient Eqypt is was believed to give magical powers to those who wore it. While that may not be true, it does help to prolong youth. It's the new anti-aging ingredient. Does it really work? We did a little scientific research and here's what we found. The Science: Collagen is the main structural protein of connective tissue. In humans this "glue" comprises between 25-35% of whole-body proteins. Copper, in the form of bound peptides, stimulates collagen and elastin formation. Both of these functions are essential in maintaining a youthful skin and in reducing the signs of aging. the copper peptide GHL-Cu is abundant is young people, but is present in much lower levels in older persons. So, to answer the question...does it really work? Yes! That's the simple answer and there is lots of research to back-up the answer. So the next question is what/where can I get copper benefits in skin care products. Ole Henricksen's Ultimate Lift Firming Serum is a top-notch copper infused anti-aging product. If you want to start care early Clinical Care's Conquer(Zit) ToneZit with Copper PCA is perfect for oily and acne skin types. Men's grooming products has exploded in the past few years. Men are no longer content to use whatever their wife has on the shelf or to style with their girlfriend's hairspray. They want products that work for them...quickly, easily and with minimal fuss. 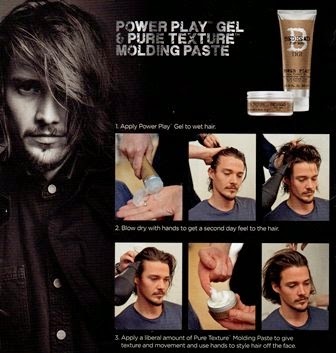 Tigi Bedhead for Men shows you two different styles trending for 2015 and both what to use and how to use them. Take a look! 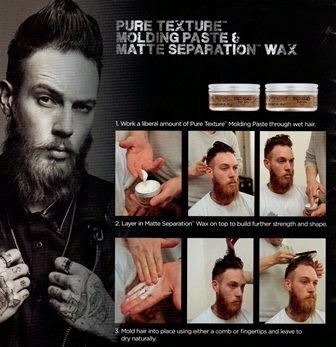 Texture Molding Paste and use hands to style off face. 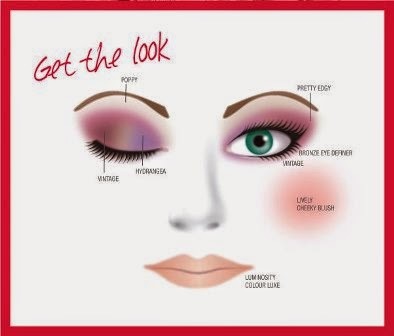 Everywhere you look you see purple eye shadow. It's the "now" look for celebrities, fashionistas and you! We show you how in our diagram below. We're using Mirabella Metropolitan Eyeshadow Quad in Purplexed. Mirabella shadows are so richly pigmented they make it easy, plus they are talc-free, gluten free and paraben free so we can use them on anyone! 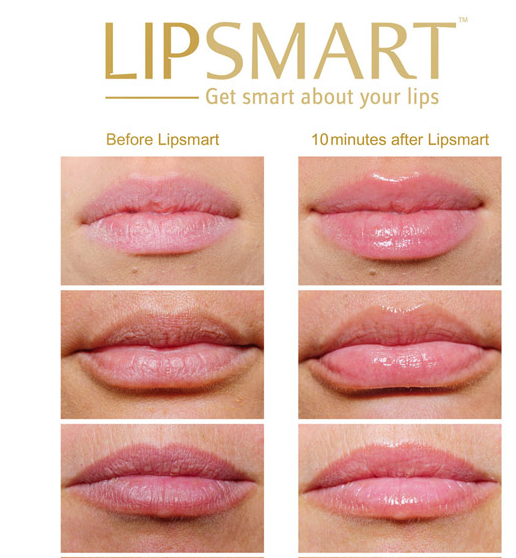 LipSmart - I can describe it in one word..."Amazing!" 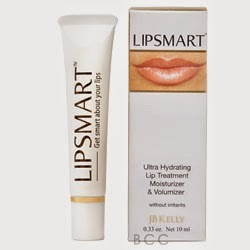 For those who don't know what LipSmart is, I will tell you. It's a revolutionary new lip treatment and volumizer. I have been using it for over a month now and I Love it! I use it every day by itself and even under lipstick when I want some color. My lips look smooth and full of life! They have a beautiful natural volume and smooth and silky. My daughter used it one day and she thought she was going to keep it and, well let's just say I didn't let her! She is in her twenties and her lips are already smooth and gorgeous. She said it instantly made her lips feel hydrated without that sticky 'Vaseline' feel to them. So, in closing if you haven't' tried this amazing product, I strongly recommend you do! 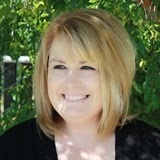 Note: Sherri is a licensed cosmetologist with over 20 years experience in the beauty industry. You'll be seeing more of Sherri in the coming weeks as she tries new products. We do supply the product, but not her opinion. That is her own. CHI Escape Cordless Styling Iron - take it anywhere! This is the best curling iron for summer. Imagine perfect hair on vacation, out camping, at dinner after a day at the beach or lake! This lightweight styler powers up quickly and holds a charge for up to 100 minutes. We like it because it's CHI...which means even heating and moisturizing shine! There are also multiple temperature settings so it works with all hair types. Order yours now while it's on sale! Get one for Mom too! It's so pretty...comes in Pearl Pink, Pearl Blue, Pearl White with purple bristles, Silver with black bristles and Black. It's not just pretty. 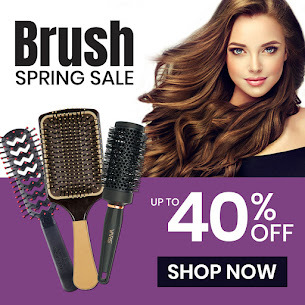 This new brush has V-shaped bristles that add shine and volume. It easily detangles knots. The bristles are also heat resistant and a special anti-bacterial additive in the plastic makes this a super hygienic brush. Tangle Angel brushes come in six difference styles, including a small one for little hands. There is also a "Pet Angel" for your pooch. P.S. Great gift for anyone! Order now! Esther was the winner of the Box of Beauty giveaway that started April 14. She's going to be having fun trying all the products! Hope you love them Esther! Congratulations! Struggling to find Mom something as special as she is! Take a look at our Mother's Day Gift Guide! It has some terrific ideas that Mom will love. Place your order and let us know it's a gift when you check out. We'll ship it directly to her and include a Mother's Day Gift Card with your personal message! Spring & Summer. Time for open toes, strappy sandals & bare feet. If you are saying "Yikes!" while looking at your feet, then you need Baby Foot. This amazing product will gently peel away dead skin in just one treatment and leave your feet feeling and looking soft as a baby's. It's easy to use. Each treatment kit comes with ﻿a bootie for each foot. Simply cut along the dotted line at the top of each bootie and secure with the tape. Now relax for one hour! (P.S. It might be a good time to deep condition your hair as long as you are doing beauty treatments.) After the hour, remove bootie and simply rinse off. That's it. Dead skin cells will start to peel within 3-7 days after your initial application. The exfoliation occurs gently and naturally. Do not forcibly remove the dead skin cells when peeling begins. The results...beautifully soft, sandal worthy feet! Order now! 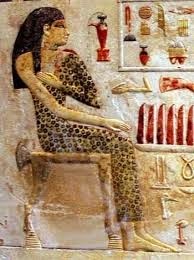 People with fragile or naturally curly hair have been co-washing for a long time. Their hair needs the extra care this more gentle method provides. It's soap free, suds-free, sodium lauryl sulfate and sodium chloride free. these can also remove natural lipids and may result in the loss of moisture and hair color vibrancy. If your hair needs extra care, these types of products can be perfect for you. Co-washing - it cleanses and conditions in one easy step. It's the perfect solution for active people who wash their hair frequently. These products remove build-up and sweat without stripping the natural oils. It's not sudsy but feels more creamy. Try Matrix Biolage Cleansing Conditioner for Curly Hair or for Fine Hair. If you have color-treated or curly hair, the Deva Concepts brand of products may be the one for you! Pre-pooing - its for those with coarse hair. This step is essential to maintain the hair's strength and quality. The tighter the texture, the more fragile the hair. Pre-pooing is the conditioning step prior to cleansing. Minardi's Pre-Wash Therapy is a great one! Oil-Cleansing - it removes direct and debris at the scalp level while exfoliating. It's feel is a lather sensation like shampoo, but with a soft, fresh finish. L'anza's Keratin Healing Oil Cleansing Cream or Alfaparf's Precious Oil Tradition Anti-Frizz Oil Shampoo are perfect choices to try. Perfect Style for soon-to-be Prom Queens? Bridesmaids? YOU! 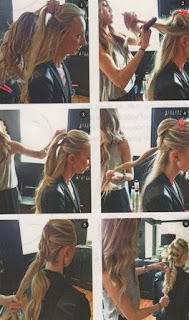 This pull-through pony fishtail updo is easy to do and looks oh so cool! The stretching you do as you style creates the "lived-in" look which also makes your braid appear thicker, with lots of texture. Backcomb at the crown and spray all over with a texture spray like Rusk's Thick Body and Texture Amplifier or KMS Hair Splay Playable Texture. Then create a ponytail at the crown with a clear elastic. Clip up the ponytail to move it out of the way and gather a second ponytail under the first. Make it in line with ears, about 1 1/2 inches under the first ponytail. Let down the first ponytail and split into two sections. Pull the second ponytail up through the split in the first. Clip the second pony up, leaving the hair from the first ponytail down. Use the hair that is down from the first pony and some hair from the sides, make another ponytail and secure. Repeat the first four stemps until have have as many ponytails/bubbles as you like. Be sure to leave enough hair for the fishtail braid. Fishtail braid the remaining hair and spray. 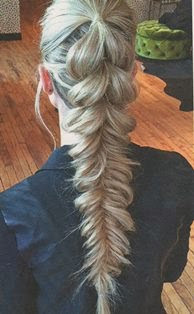 While holding the braid at the end with a light tension, stretch the fishtail braid from bottom to top. Don't over do it. You can stretch more, but you can't do less once you've stretched. That's right! We have it in stock and ready to ship to you. This is an amazing product that takes at least ten years off your face. It reduces puffiness to almost zero, erases fine lines and brightens the eye area. Everyone is talking about it. Don't miss out! 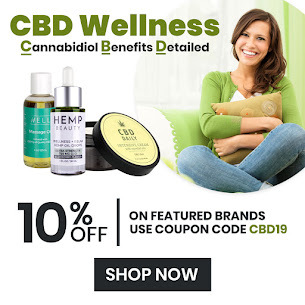 Order yours today by clicking here! 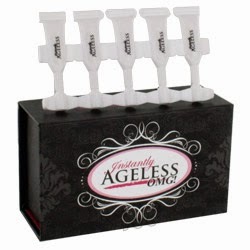 Each vial will provide about three applications and each application will last up to 8 hours! Yeah for Dawn from Georgetown, Delaware. She is the winner of the Box of Beauty giveaway for the week starting 4-7. Enjoy it all Dawn! A deep side part creates a dramatic effective with a natural-looking flow. Take a look! Margot Robbie, actress on The Focus, has a deep side part on her bobbed shoulder length hair. To recreate the look, blowdry smooth and straight, slightly bending the ends as you move downward. Finish with Redken's Diamond Oil Airy Mist for a boost of shiny power. Chrissy Teigen's wavy locks are gorgeous. To get this look, apply volumizing foam to wet hair and blow-dry large sections with a round brush. Create a deep side part and wrap small sections around a one-inch curling iron. Brush hair slightly to relax the waves and spray with Macadamia Professional Flex Hold Shaping Spray. Apply a quarter-sized amount of Macadamia Professional Nourishing Moisture Oil Treatment through the ends to increase shine. Is your skin naturally on the dry side or is it dehydrated? Determining which is important in providing your skin with the product(s) needed. "Dry" is a skin type related to oil production. If your skin is genetically predisposed to produce less than adequate oils, then you are likely going to have chronically dry skin. If this is your problem it can worsen when you use a powdery make-up or harsh skin cleansing products that strip away the little oils you have. "Dehydrated" is a skin condition related to the water content of skin cells. It is associated with a crepiness or small lines that form when skin is manipulated. Common causes are mostly lifestyle based, including smoking, certain medications, a diet high in salt or caffeine as well as seasonal changes and environmental factors such as heating and cooling systems. It is also a good indication you are not drinking enough water each day. An oil infusion can be very effective. First wash your face thoroughly with a gentle cleanser and exfoliator. If you don't already have one, DermaE's Glycolic Facial Cleanser with Marine Plant Extracts is great for this! Next smooth on the skin oil. We can recommend Amir 100% Pure Rosehip Oil or Amir 100% Pure Argan Oil. Leaving the oil on the face, apply steam for 10 minutes. (If you have a facial steamer, great!. If not, boil water, remove from the stove and put inside a "tent" you make with a towel. Be very careful not to burn yourself.). Naicinamide, a potent form of vitamin B-3 that is a multifunctional approach to both dryness and dehyration by boosting ceramides and fatty acids. Multi-weight hyaluronic acid is well known as a skin hydrating ingredient that is very effective. You want a product that features multiple weights so all skin health is addressed. Decide on the type of salon ambiance you would enjoy. You will spend as much as four hours of a day every six to eight weeks sitting in a chair there, so being in comfortable will make you much happier. Do you like it young and hip with trendy music, quiet and refined with soft classical music, a comfy neighborhood feel? It is more likely you will find your right stylist working in a place where you feel comfortable. Ask a friend or two or even the lady next to you in a checkout line if you like how her hair looks. Recommendations, both pro and con, will help you. Know your hair type. Many salons or stylists specialize in curly hair, ethnic hair, or thinning hair. If you have special needs hair then be sure one of your considerations is the stylist's skill with your hair type. Walk into different salon lobbies. Get a feel for the atmosphere and clientele. Check out the prices for services. It's no use moving ahead if their prices are more than you can afford to pay. If you are happy with everything, then work with the receptionist to schedule a "no cost" consultation. At your consultation, discuss openly what your expectations are, show pictures of different hair styles you may be considering. Consider their reactions. See if they offer ideas you like. Don't be afraid to say "thank you for your time" and walk out. If, however, you get a positive feeling, like what they have to say and their ideas, then go ahead and book the appointment. 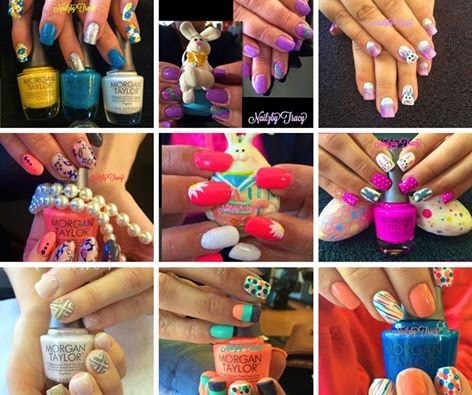 The Box of Beauty winner for the week 3-31 to 4-6 is Katherine R from Springfield, Ohio. Her box of products is on its way to her and we hope she loves them all! Have fun Katherine! We love it! This intense hydrating lip treatment makes your lips look and feel soft, hydrated, fuller and smoother. Sold throughout Norway's salons and spas (and soon expanding throughout Scandinavia), it's now available at Beauty Care Choices. After a long winter of drying indoor heat and outdoor cold, your lips will really love Lip Smart. Lakme has three brand lines and you can be sure to find the perfect hair care products for your hair and your style. Lakme Teknia shampoos, conditioners and treatments restore and rejuvenate hair with natural ingredients and advanced technology. Lakme K Style will let you construct and hold your style whether it's bright & breezy or wildly structured! These styling products can be Xtreme! Lakme K Therapy is all about spa hair and skin care! Give yourself the sensation of spa comfort and a sense of well-being. These products enrich both hair & skin with essential elements and minerals. Whether you participated or look aghast, the punk rebellion and revolution of the 1970's had it's influence on fashion and hair. It didn't meet the traditional standards of beauty and harmony...choppy, chewed and spiked textures made being a bit random demonstrated the independent thinking and bold statement of the generation. Updated for today, these strong but feminine styles are today's woman who wants to make a bold statement! demonstrates how high fashion can meet sass! of Shock Rock" pushed the boundaries. Redken's new Frizz Dismiss line of products is perfect for all hair types fighting frizz. Even extreme humidity won't beat it! The sulfate-free shampoo, conditioner, and styling products work in tandem for frizz free hair even after 24 hours! Imagine your hair without frizz and fly-away strands! BCC has the complete line in stock and ready to ship today! Fine to Medium Hair...pick Frizz Dismiss Smooth Force Lightweight Smoothing Lotion Spray.